This page contains information and pictures about Ladybird Beetles that we found in the Brisbane area, Queensland, Australia. Ladybird Beetles are also known as Ladybugs and Lady Beetles. The adults are oval domed in shape, range in length from about 1 mm to about 10 mm depending upon species. Females in general are a little larger than males. Like all beetles, their hard forewings cover the membranous hind wings and protect the abdomen. Their legs and their clubbed antenna are short, which are usually hidden beneath their bodies when disturbed. Most Ladybird Beetles are brightly colored. This is a warning signal to tell the predator that the ladybirds are distasteful and toxic. When disturbed some ladybirds may emit a strong smelling yellow liquid as a deterrent against predators. Ladybirds are complete metamorphosis. 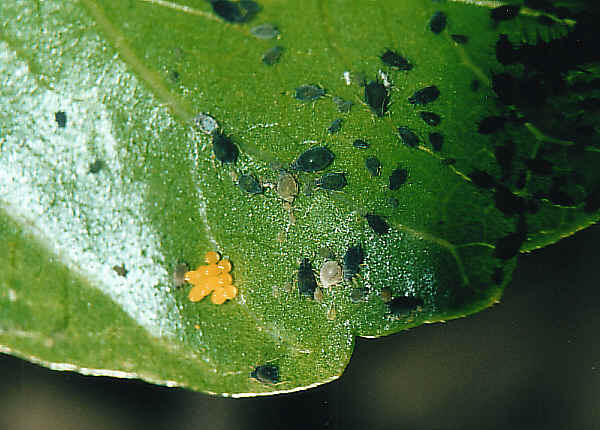 Females lay clusters of 10 to 50 yellow spindle shaped eggs on plants near aphids. 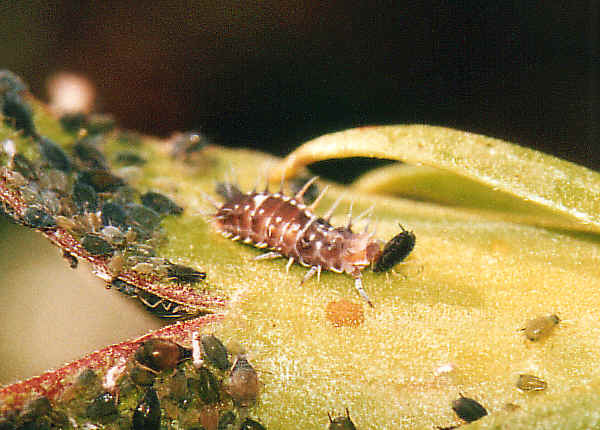 Newly hatched larvae are gray or black and less than 4 mm long. Later stage larvae can be gray, black, or blue with bright yellow or orange markings on the body. Their larvae undergo four instars before pupating. Ladybird beetles develop rapidly. The larva emerges from the eggs about 1-2 weeks. The larva reaches maturity within 2 weeks. Pupation takes place on plants where the larva fed and the adult emerges from the pupa after 1-2 weeks. As their adults, the larvae have long sharp mandibles and feed on small insects. The larvae are elongate and slightly oblong in shape. They are usually patterned with colours similar to their parents, and many are adorned with spines. The pupae are usually brightly patterned and can be found attached to the leaves and stems of plants where larvae have fed and developed. For more information on ladybird life cycle, please visit our Common Spotted Ladybird page. 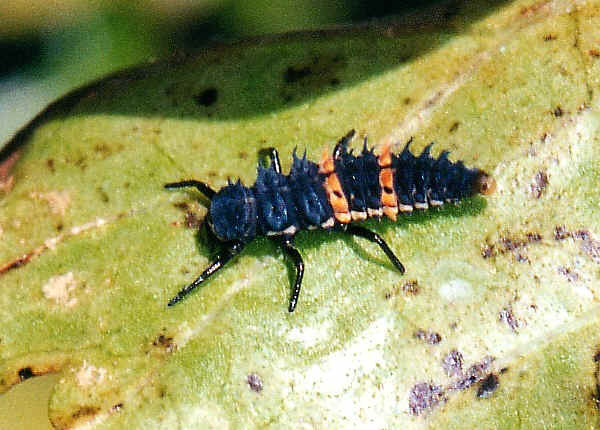 Most Ladybird adults and larvae are predators. They feed on very small insects such as aphids, scale insects and mite. Both adults and larvae may be found on the same plants feeding on the same species of prey. They may consume flower nectar, water and honeydew from aphids as supplement. However, a few of them are plants eaters. When ladybirds sense the danger, such as when we come close to them, they hide their legs and antenna under their body. When we come closer, they slide to the edge of the leaf and drop to the ground. We always put our hand under the leaf before we approach to a ladybird. The ladybird will drop onto our hand, it usually hides its legs and antenna under its body. After a while, when its feel there is no danger, it will walk around on our hand, some will fly away very soon. This is all right to handle Ladybird Beetles by bare hand (not recommended for other insects), they do not bite. Following is the list of ladybirds that we found in Brisbane. There are six subfamilies of ladybird beetle in Australia. The Sticholotidinae are very small beetles, Less than 2mm in size. We sometimes find them on leaves feeding on small soft body insects. We did not take any photo of them yet. 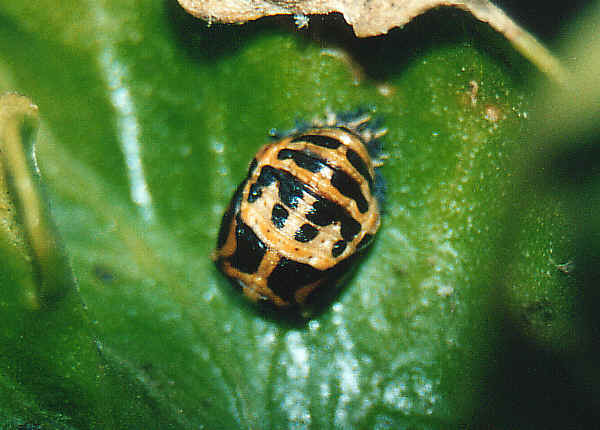 Scymninae ladybirds are small to medium size, covered with short hairs. They feed on scale insects, aphids and spider mites. Chilocorinae ladybirds feed on different type of scale insects. They are shiny colour and have no pots nor patterns on their wing-covers. They are medium in size. Coccidulinae are small, elongated and covered with small hairs, They prey on aphids. We did not find any of them yet. The Coccinellinae ladybirds are medium to large size ladybirds that are shiny and often have bright spots. They feed on thrips, aphids and other small insects. Some species feed on fungi. Unlike other ladybird beetles, all species in this Subfamily Epilachninae are phytophagous. Both larvae and adults feed on plants. Some are pests on agricultural crops. They are relatively large in size, covered with short hairs. 2. Genera of Coccinellidae - The University of Queensland Insect Collection, 2004. 4. Coccinellidae - (Ladybirds or Ladybeetles) - L E E P Y - L I Z A R D ' s (Insect Pages). 5. Ladybugs - Web page, University of Florida, February 2004. 6. Ladybird beetles - Coccinellidae - Transvaal Museum. 7. The London and Essex Ladybird Surveys - PAUL MABBOTT, 2005. 8. Killer Ladybirds - Scribbly Gum, ABC 2005. 10. Order : Coleoptera, Common Name : Beetles - South Australian Research and Development Institute 2001. Last updated: October 06, 2005.